Set on a secluded peninsula that juts into the Mussel Ridge Channel in Penobscot Bay, Birch Point State Park (South Shore Road, Owls Head; 207-941-4014) may be small, but its huge views more than make up for it. This ocean-front park boasts a crescent shaped sandy beach that’s perfect for fishing, swimming or picnics. This park is only open during the summer. Keep your eyes open for the resident harbor seals, ospreys and eagles, but leave your pets at home. Entrance fees start at $2 for adult residents, $3 for non-residents, and $1 for seniors and children. 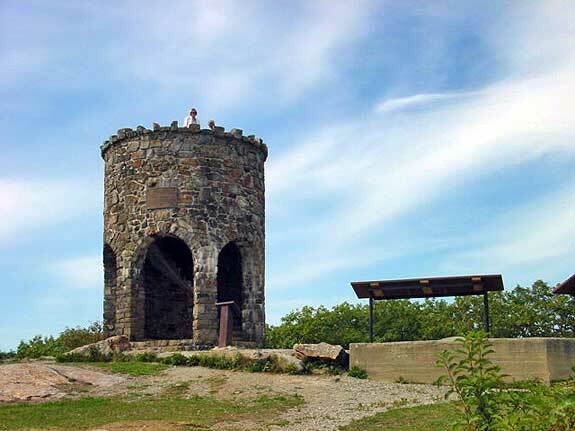 Camden Hills State Park (280 Belfast Road, Camden; 207-236-3109) offers views of Penobscot Bay and Camden’s cityscape from atop 800-foot-tall Mt. Battie. The park is also well-known as a bird-watching destination; it’s home to migratory hawks, great blue herons, brown thrashers, bald eagles, nesting terns, ospreys and piping plovers. With 30 miles of hiking trails, 112 campsites with hot showers, a rocky shoreline and excellent fall foliage viewing, Camden Hills is a popular destination, spring through autumn. Leave the pets at home. Entrance fees start at $3 for adult residents, $4.50 for non-residents, $1.50 for seniors, and $1 for children. Damariscotta Lake State Park (8 State Park Road, Jefferson; 207-549-7600) is just a few miles from the state capitol at Augusta. This 17-acre park offers swimming, sunbathing and canoeing in the fresh – and lifeguarded — waters of Damariscotta Lake. The park has an activity field, a playground and picnic areas with running water, electricity and a communal grill. It’s open from Memorial through Labor Day. Pets are welcome. Entrance fees start at $4 for adult residents, $6 for non-residents, $2 for seniors, and $1 for children. Moose Point State Park (310 West Main Street, Searsport; 207-548-2882) is known for its stunning views of Penobscot Bay; the best way to take it all in is on The Loop, a 1.2 mile trail that rings the park. Climb the stairs to the water’s edge and explore the rocky tide pools, keeping your eyes open for the porpoises and seals. Take a break at one of the park’s seven picnic areas. Other hiking trails pass through cool, evergreen forests, complete with blueberry bushes and the resident bird population, which ranges from double-crested cormorants to bald eagles and loons. There’s also a playground, a gazebo and a group picnic shelter. Dogs are welcome, but must be leashed. Entrance fees start at $2 for adult residents, $3 for non-residents, and $1 for seniors and children. Owls Head State Park’s (106 Hogan Road, Bangor; 207-941-4014) lighthouse stands watch over the southern entrance to Rockland Harbor and dates from 1825. At 30 feet tall, this historic lighthouse’s location atop a promontory gives it height. You can spend an enjoyable day exploring the lovely grounds, poking through tide pools on the rocky shore, walking through the history cemetery picnicking in the park’s forested grove. Leashed dogs are welcome and there’s no entrance fee. Popham Beach State Park (10 Perkins Farm Lane, Phippsburg; 207-389-1335) draws visitors with its long stretch of sandy beach, set where the Kennebec River meets the Atlantic Ocean. From bird watching to beachcombing, swimming to sea kayaking, this day-use park offers activities for the whole family. Set on 529 acres, it features bathhouses, cold showers, picnic areas with grills, and tide pools for the kids to explore. No dogs are allowed. Entrance fees start at $4 for adult residents, $6 for non-residents, $2 for seniors, and $1 for children. Reid State Park (375 Seguinland Road, Georgetown; 207-371-2303), home of Maine’s first state-owned saltwater beach, was created in the 1940s. Its sandy dunes are home to piping plovers, least terns and other seabirds. Visitors can climb to the top of Griffin Head for stunning views of the ocean, lighthouses and islands. The park is open year-round and offers walking trails, picnic areas and a group shelter. Dogs aren’t allowed. Entrance fees start at $4.50 for adult residents, $6.50 for non-residents, $2 for seniors and $1 for children. Swan Lake State Park (100 West Park Lane, Swanville; 207-525-4404) encompasses 67 acres, complete with a sandy swimming beach, picnic spots, hiking trails and washrooms. The beach is lifeguarded from Memorial to Labor Day. Other popular activities on this 3-mile-long lake include paddling and fishing for smallmouth bass and perch. Dogs aren’t allowed on the beach. Entrance fees start at $4 for adult residents, $6 for non-residents, $2 for seniors and $1 for children. Accessible only by private boat, Warren Island State Park (P.O. Box 105, Lincolnville; 207-446-7090) in Penobscot Bay offers the ultimate in low crowds. This 70-acre park is covered with spruce trees and offers 12 tent campsites and three Adirondack shelters with drinking water. It’s open Memorial Day through September and leashed dogs are allowed. Entrance fees start at $3 for adult residents, $4.50 for non-residents, $1.50 for seniors and $1 for children.